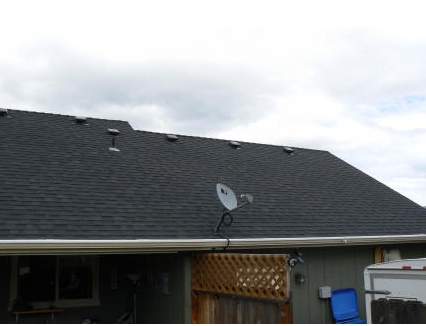 Here is another simple scheme for using solar heat from the attic to provide free space heating. 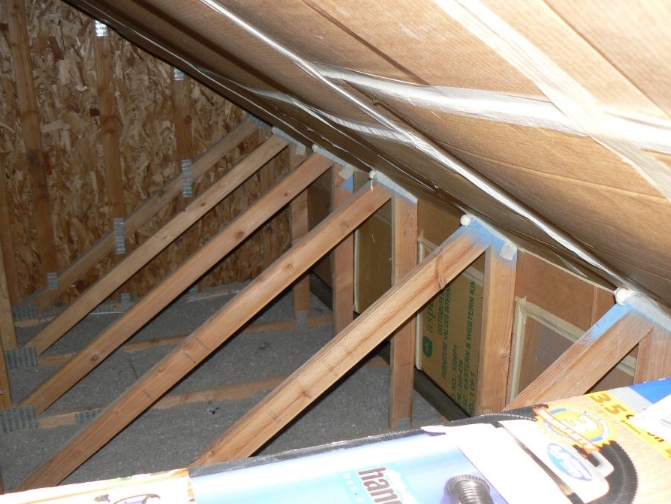 Randy sheeted across the back of some of his attic roof truss bays to from the channels for a collector. He then added an intake plenum at the bottom and a exhaust plenum at the top. So, air flows from his living room via a 12 inch duct to the intake plenum, then up through the truss bays picking up heat from the under surface of the roof, and then into the exhaust plenum, and finally back to the living room via another 12 inch duct. The flow is powered by an attic vent fan that includes a 93F thermometer to turn the system on when the attic air gets up to a useful temperature. While the system is currently prototyped in cardboard to see how well it worked, Randy plans to replace the cardboard with rigid polyiso foam board. One remaining challange is a good backdraft damper to prevent cold air from thermosyhphoning into the living room at night -- any ideas? Randy is planning to try picking up attic air to run the clothes dryer with. The collector is invisible from the outside. Note that I'm trying a new comment system that you will see when you go to Randy's project page -- I'd appreciate hearing any feedback on the system or problems using the system. They sometimes insulate between the roof truss bays to include the attic space inside the conditioned space --in this case the insulation goes right up against the bottom of the roof sheathing. My house has some areas done this way with polyu foam insulation. I've heard that the roof shingle makers don't care for this arrangement because it makes the shingles run a bit hotter, but have not heard of any other problems. I suppose one could open some small vents in the plenum in the summer if this was a concern -- it should still leave good heat for the dryer. Randy, I've read your articles on the Attic heating and am going to do some on mine also. I have read about "Breadbag" backdraft dampers in OCT 2010 Yahoo group. Sold as Cape named in the IAQ website. I'm thinking of trying to DIY some of these.